I colored Emily with the Copic markers shown on the left--yes, that's a bunch of markers! The colorless blender in the lower left is a custom blend of half colorless blender and half BG000 ink. Emily's a fun-loving girl, so I chose to go with a retro party look for papers, Cosmo Cricket's Wednesday and Saturday papers from the Girl Friday Collection. The mat cardstock layers are SU's Rose Red, and the birthday wishes tag, cut with a Spellbinders Tags Trio die, is from PaperTrey Ink's Mixed Messages set. This week's CPS 116 sponsor was Emily at Stamping Bella. Aren't these little vases fun? What more could you ask from a stamp--color-able and paper-piece-able! I stamped the Flower Bottles image on Stampers Select White cardstock (PaperTrey Ink) with Tuxedo Black Memento ink and colored it with the Copic markers shown below. That one on the right end is my blend of BG000 and clear blender fluid--just a lighter blue that is easy to blend into the paper. Next I stamped the vases on three different scraps of Cosmo Cricket's new Early Bird** paper, trimmed them closely, and glued them on top of the stamped vases on the focal image. 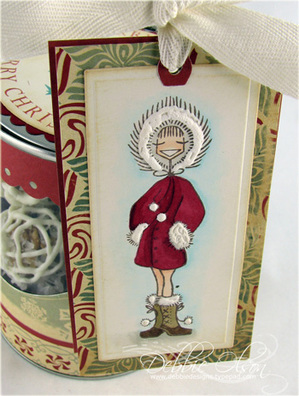 The little smile sentiment is from the Melissa Frances Inspiration Rub-On Transfers set. 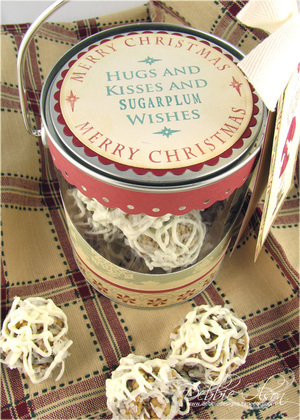 That small tag is cut with a Spellbinders Double-Ended Tags die, then trimmed to length by hand. The focal image is cut and embossed with a SquareNestability. Buttons are mostly PaperTrey Ink Vintage Buttons. I added a touch of Stickles (Aqua and Yellow) to flower centers and raised just the single rose blossom. I'll be blogging as often as possible this week, but I have family visiting who are headed overseas soon. I'm squeezing out all of the time to spend with them that I can! I hope that you have some unexpected smiles today; thanks for visiting. The Snowbunny image is colored in Copic markers: R46, R59, E00, E02, E55, E57, BG000, W1, and 0. I used some white Liquid Applique to add furry trim to her coat and cut and embossed her with a Spellbinders Long Rectangle Nestability. For the top of the can I pulled out a new Just Rite Stampers set, the Christmas Stamp Ensemble, sized to fit the 3-1/4" Harmony Classic Circle Stamper III handle. If you happen to order this set, you'll probably notice that mine is a little different from yours. . . On the "Hugs and Kisses" center, I decided to tweak the wording. I thought that since I was already using the "Merry Christmas" outer border, rather than using "Holiday Wishes" inside, I'd leave "Holiday" out and put a food term in there. 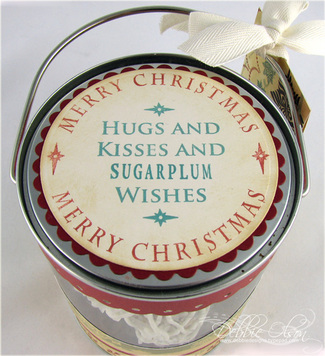 I used letters from my Times New Roman Alphabet to spell out "Sugarplum." Yes, the font is a bit more condensed, but I'm okay with that. I used my Spellbinders Petite Circles Nest to frame my lid, adding some Antique Linen Distress ink to the edges. I can't wait to see what they've all come up with! 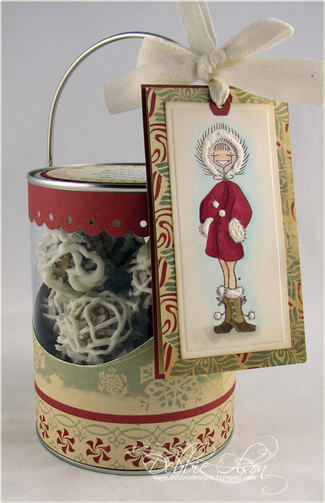 I hope to see you again later today for the PaperTrey Ink Blog Hop as well. Have a great day! My son said that they needed to be a little sweeter; I thought they were sweet enough, but since I wanted them to look whiter, I drizzled melted white chocolate over them. He was a happy camper. My husband (who generally likes only his OLD favorites) commented that "Those cookies sure tasted better than they looked!" Bwahahaha! Just when we think we made something pretty! The image is stamped in Memento Tuxedo Black ink on PTI Stamper's Select White cardstock and colored with Copic Markers in the colors shown. Card base is Stamper's Select White, and card front is PTI Berry Sorbet, stamped with the CHF Polka Dots Backgrounder in Berry Sorbet ink. I used a Spellbinders star die to cut four small stars, then glued them together to form faux-chipboard, mashed them into my glue pad, and covered then with iridescent glitter. The "birthday wishes" tag is from PaperTrey's Mixed Messages set, and ribbon is Berry Sorbet polka dotted satin. Mat layer under the focal image is PTI Lemon Zest. Finally, I coated the cherry in Stardust Stickles. A big "mwah!" to Emily for such a fun image! It's terribly sneak-peeky time of year, isn't it? Tonight we have PaperTrey at Amy Rysavy's blog, as well as at Nichole's, Alli's, and Melissa's blogs. 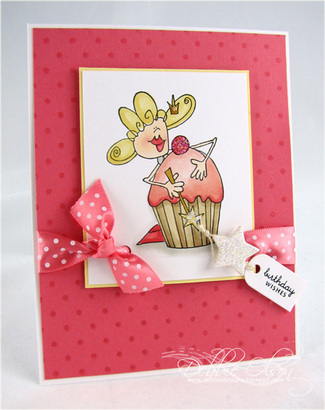 For Spellbinders, the final Sneak Peek will be at my blogging buddy Trudee's. I also heard that Just Rite Stampers has been showing new products here. Enjoy!